Jan 1 Choccoloco creek. In the WS Project X56. With Joan S. Temp 58, water level low, drizzle rain. Jan 14 Cahaba. In the WS ProjectX 56. With some boaters I had never met before. 280 upstream towards the water plant. 2 hr paddle, 75 degrees, drysuit was overkill. Flatwater. Jan 21 Glenn Mills Memorial. I joined Martha and many other cavers to celebrate the life of my friend Glenn. Jan 22 Hydrology study; springs near Sewanne Tn. With Kelly and Jason, and some hydrologists from the USGS. Springs included Owen Springs, Gourdneck Springs, and Blowout Bluehole. 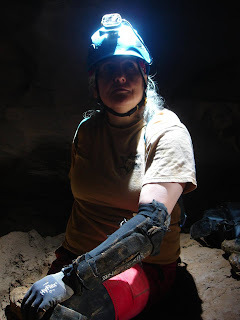 Jan 28 Caving. 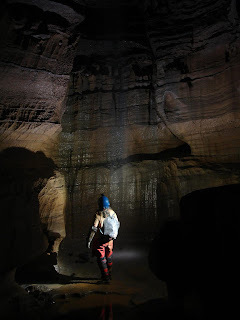 With B'ham Grotto to unnamed cave. Great day. Jan 29 Locust Fork. In the LL Stomper 80. Level 2.4. Nice level... air temps mid to upper 40's. With Sally purple-hair, David in the Outburst, new canoeist Trent. 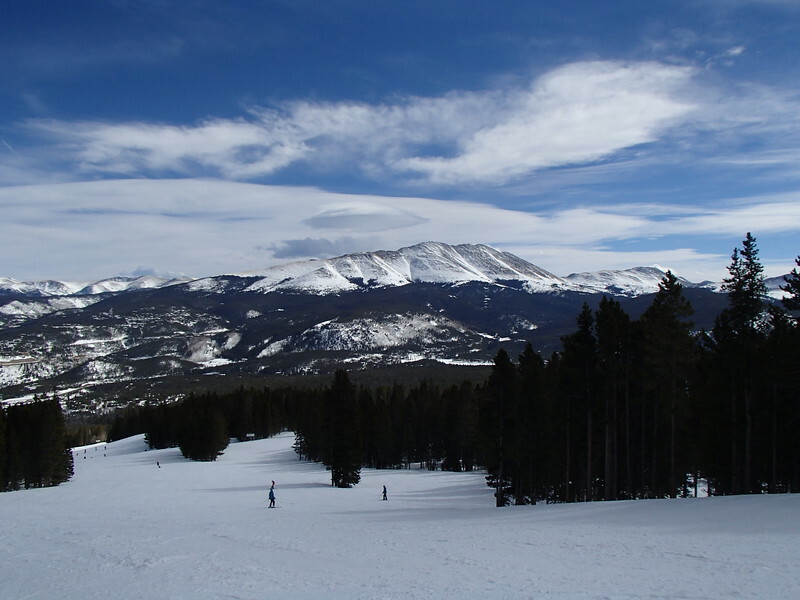 Feb 8-12 Breckenridge. Awesome trip, best I've ever skied... photos here. Feb 17-19 Grotto Getaway. At Paint Rock Valley Lodge. Photos here. Feb 25 Ridgewalk. We returned to try to dig out the lead Dave found the year before. Video here. March 3-5 Mulberry Fork Races. I volunteered as gate judge and safety boater for the downriver race. I didn't race this year. March 10-12 ALF 2017. Tellico low flow in the snow on Saturday, perhaps 1.5? Highs in the low 40s, brrr. But gorgeous. Tellico very low flow on Sunday, 1.4 I think, highs in the low 50's but sunny. In the Stomper 80, I caught much flack for not paddling a canoe. With the Lost Tribe. Photos here. sunny skies by the end. Temps started in the upper 50s and went to 71 at the takeout. Level 640 on the Arkadelphia gauge; perhaps 10" on the bridge gauge. Lunchstop was a nice wave but I found 5-0 to be trashy foam pile, glassy wave in center was very very shallow. Didn't bring my camera. I haven't been updating this blog in a timely fashion. I hate it because I don't remember the river level data to post so I can compare it later. I'm trying to get a correlation set to the Arkadelphia gauge. March 26 Mulberry. In the Necky Chronic. Level around 1 foot. Discovered Birthday Wave below the rock at Glen Clark Memorial. Was Norma L's b'day. Great group. Combat roll at Lunchstop. Me on the wave I dubbed "Birthday Wave" as it was Norma's B'day. This is only in below 1.5 on the bridge gauge. April 1st Paddlefest. At King's Bend, the first annual Paddlefest. In the Necky Chronic. Level around 2.7. Took out at Swann. April 2 Mulberry. In the Bell Ocoee canoe. Level 1.5. Air temp around 70. Wonderful day. April 9 Mulberry. In the Necky Chronic. Warm, sunny day. First time using the AT Eddy Flexi paddle, 197 cm. 30 feather. First lap with Drew M. and Lance H. We saw a bald eagle and two osprey during our trip. After shuttling back to the putin I saw the Neeses getting ready to paddle and went down the river with them for another lap. They were catching a lot of spotted bass and at the take-out I caught one as well (this is unheard of: for a Ranelli to catch a fish). April 15 Paddling 101 class. At Oak Mtn. state park. April 22 Rolling practice. At Oak Mtn. state park. With Russel B and Travis H.
April 23 Locust Fork. In the LL Stomper 80. Level low (didn't make note of it), water and air comfortable, pretty day. April 29 Nantahala Open. In an inflatable pink flamingo, and various other craft. Photos here. May 6 Float the (Mostly) Lazy River. In the Dagger Axis 10.5. Cahaba Grants Mill to Overton. Level 118 cfs, was plenty of water. Water temps cool but comfortable, weather sunny and low 70's. Photos here. I caught a fish, second fish this year. Amazing. May 13-14 Ocoee. In the LL Stomper 80. With Clayton V., Steve I. Sunday I watched as Mary M. had a bad swim in Grumpy, kind of shook me up so I took out at Go Forth. Mary took off after her swim because she took a head shot. She's fine but retired the helmet. May 19-21 SERA 2017. At Sequatchie. I didn't cave. Took some photos at Waterworks and Russell Cave national monument with Jeff H. Photos here. 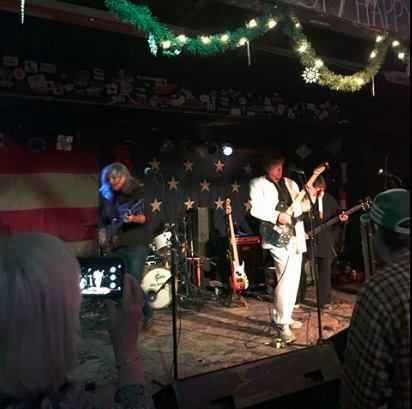 Sunday I drove to the Ocoee and put on at Slice and Dice. The TVCC were there so I went with them to Go Forth. Practiced rolling with Deborah W. and Sue (don't know last name) then drove home. May 27-29 Memorial Day Weekend. 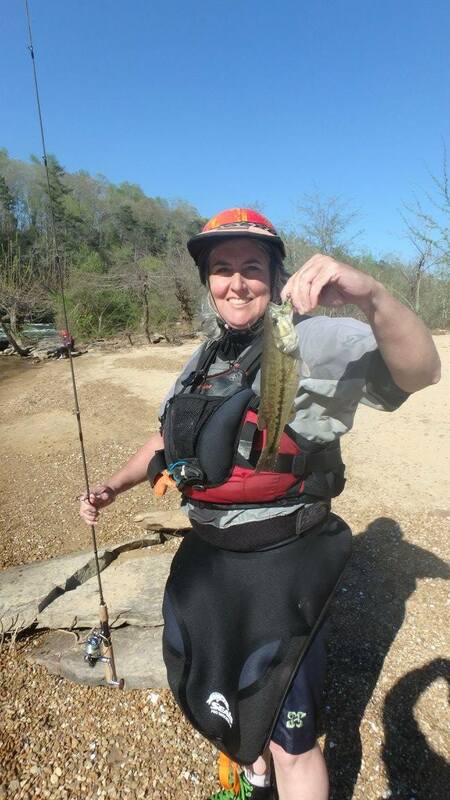 Saturday I said hello to the Hiwassee for its first release of the season. In the Necky Chronic. That night I stayed in Christine's little camper as she was with the grandkids at another campground. Huge rainstorm that night; I was grateful to be inside. Sunday I went on a hike with Christine's family to a waterfall near the Hiwassee, then drove home. Monday I went on the Mulberry at about 1.25 feet, in the Stomper 80. Warm, Wonderful Weekend! June 3-4 BCC Class with Joy C. in the LL Stomper 80. I drove up Saturday. We did drills at the Ocoee take-out, then paddled the lower Hiwassee. Take-out was the drive-in picnic area. Sunday we did the 'regular' Hiwassee. Great times. June 9-17 Rogue River trip. In a rented Dagger Mamba 8.1. 4 nights 3 days on the river. Also visited Grant's Pass and Ashland Oregon. Wonderful trip! High water. 6k when we put on, 5200k when we took off! Photos here. June 25 Talladega Creek. In the Bell Ocoee Canoe. Level 2.5 at the mill gauge, wonderful level! Warm water and air temps. The best. Railroad trestle rapid was padded and reminded me of a Middle Tellico rapid. I did not run Rob Roy, Arlene S. paddled it through for me. Photos here. July 2-3 Week of Rivers. Saturday, Tuckaseegee, high flow release, in the Project X 56. Warm day with no rain. 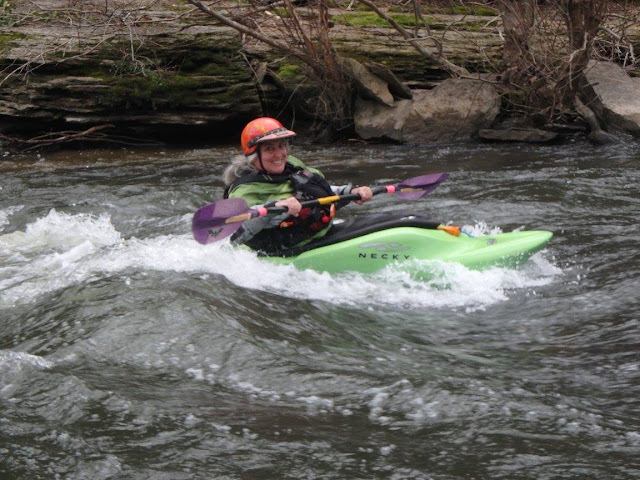 Sunday Nantahala, put-in to Surfer's, in the LL Stomper 80. Warm, some rain. Photos here. July 8 Locust Fork. In the WS ProjectX 56. Level approx. 3.5 feet, warm air and water. With Vander H., Janice and Josh, Russel B., many others on the river... great level! July 15 Paddling 101 class. For the B'ham Canoe Club. We had 8 students. At Oak Mtn. Swimming Lake. July 16 Locust Fork. In the WS ProjectX 56. Level 2.6 feet, warm and sunny. With Norma L., Russel B., and others. Great day! July 23 Conasauga Snorkel Hole. With members of the Birmingham Grotto, Christine B. and a friend of hers. Always a cool place to snorkel, lots of fish. August 5-6 BCC Beginner Kayak Class. I helped teach another beginner class for the BCC. August 21 Eclipse! Totality! 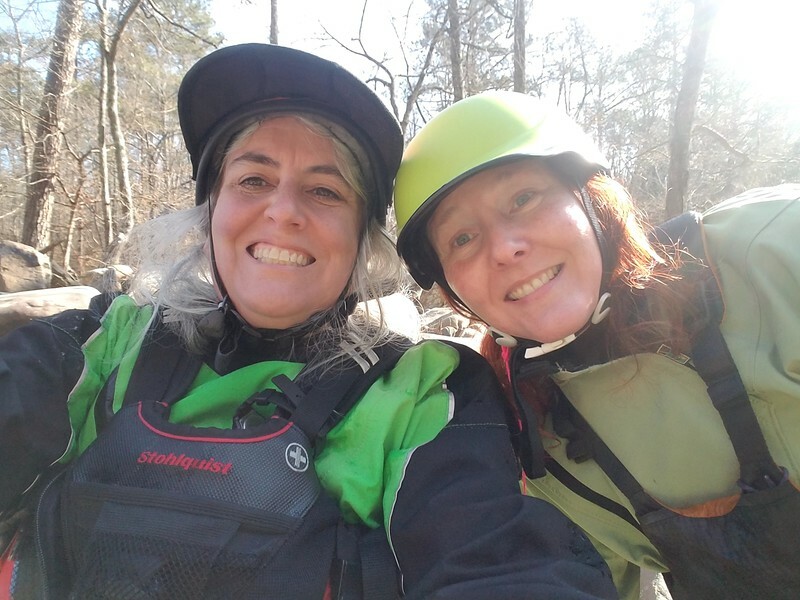 On the Hiwassee River, in the Hyside Paddlecat, with Kathy K. and Lisa B.
August 26 Grotto Splash. At Rickwood Caverns. With members of the Birmingham Grotto. August 27. Coosa. 8000 cfs, in the ProjectX 56. With Joan S. Fall is in the air. Sept 3 Middle Ocoee. In the Hyside Paddlecat. With Christine B., Bill Mc, Sally Purple Hair. Sept 9 Oak Mtn. Lake. In the Stomper 80. With Kahyee and Clayton, Russel B. I don't know why but I felt inspired to try my hand roll and backdeck rolls, and hit them all. Nice feeling! Sept 16 Middle Ocoee. In the LL Stomper 80. With members of the BCC. Nice dry hair day, weather mild and sunny, and water temps mild as well. Sept 23-24 GAF (Nantahala Outdoor Center's Guest Appreciation Festival). In the Covert Tandem OC2 on Saturday on the Upper Nantahala. Sunday I did a quick lap on the Ocoee in the Stomper 80. Oct 6-8 TAG Fall Cave-In. Nice weekend. Didn't take pics. Oct 14 Hiwassee. Said goodbye for the season to the Hiwassee. In the LL Stomper 80. With Matthew W. and his family. Oct 15 Ocoee. Said goodbye for the season to the Ocoee. In the LL Stomper 80. Oct 17 - 21 Adobe Max Conference. In Las Vegas. Amazing Conference. Pics here. Oct 31 Mulberry Fork. In the LL Stomper 80. Brisk, wore my drysuit. Level 1.5. With Vander, Ginny, Tim R.
Nov 4-5 Locust Fork. In the LL Stomper 80. Warm, upper 70's, sunny! Level 2.4. Wonderful level, plenty of surfing, boof rocks. With Clayton V. and Kah Yee, Norma L, Josh and Ginny, Mark K., Matthew W., others on Saturday; Ming, Daniel Kayak, others on Sunday. Great weekend! ...no rain means no local water, except for the OCOEE! The flume is broken by a giant boulder, near Diamond Splitter. This means that when Ocoee plant 3 is generating, flow will go down the riverbed. It's not a full release but it's plenty. It's like a Christmas gift to SE paddlers. 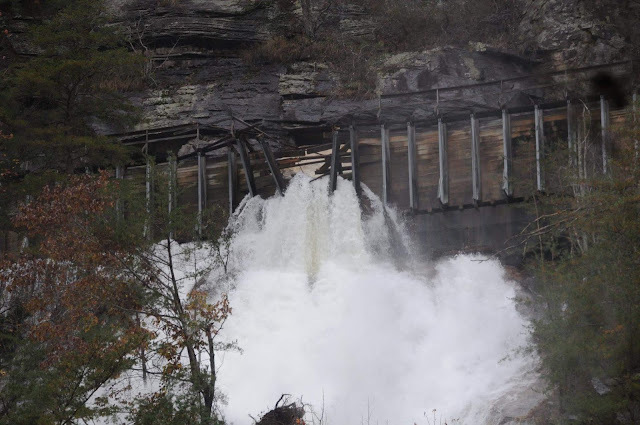 Flume box broken on the Ocoee. Dec 3 Annual campout at Moses' Tomb with the Birmingham Grotto. Dec 4 Ocoee. level in the 1100 range, air temps 50's, drysuit weather with sunny skies. Dry hair day. With Clayton V., Spence I, Mark K. In the LL Stomper 80. Some lines were bony, some surprises in Accelerator and Broken Nose, and Tablesaw was steeper and more violent waves. I love my Stomper! My camera is AWOL and I am not comfortable taking my phone on the river; though it is waterproof, there's no leash on it. Dec 16 Ski Cataloochee. With Joan S., dinner with Wendy A. Nice day skiing, except for the time I fell getting off the lift at the top of the big hill and dented my helmet. This trip we essentially ran laps on the black diamond run. Which would be a blue out West. We met Wendy for pizza that night, and the next day we drove to the NOC and had sherpa rice at River's End. Met up with Steve P. to visit while he and his crew did laps on Nantahala Falls. Kicked ourselves for not bringing our boats. Dec 24 Mulberry. At 2 feet. In the LL Stomper 80. Drizzle rain, cloudy, 40's. With Andy and Lynn. River to ourselves, except for Ken and his sons at 5-0 park and play. We had to talk ourselves into going. But were so happy once we were on the water. We also talked about this being a checkout run for our winter gear. Also it's 'the way the weather generally is' when you want to paddle Alabama in the winter. Then Christmas Eve dinner with my family. Dec 25 - sad news - My sister Marilyn passed away. Dec 25 - Ticks at the Nick. We decided to do the show we had planned despite the sad news of the passing of my oldest sister. It was the right decision. It was a very crowded show and I saw many people I never get to see very often. Dec 26 Mulberry. At 1.8 feet. In the LL Stomper 80. Sunny, upper 40's. With Clayton V., Janice and Joel, many others. Riley C. tearing up vertical moves in the Prijon Alien. Dec 28 Mulberry. At 1.5 feet. In the LL Stomper 80. Sunny, mid 40's. With John D., others. John cut the wood out of the playspot river left of Glen Clark Memorial. Dec 30 Locust Fork. 2.5 feet is my guess. In the LL Stomper 80. Sunny, upper 40's. With 8 boaters from Nashville, Vander, Fred H., and others. Photos and a couple of videos of Double Trouble here. Janice Cicero Booth and I at Double Trouble. So nice to paddle with the Booths!